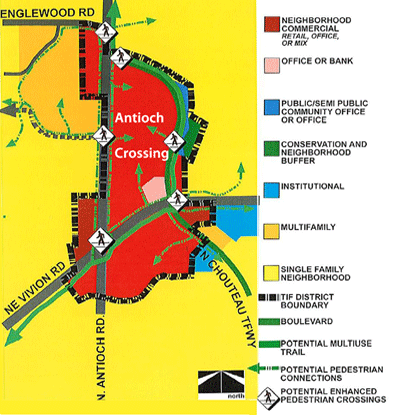 Antioch Crossing is located in the Northland at the crossroads of Antioch Road, Vivion Road and Chouteau Trafficway. Formerly the Antioch Center Mall, Kansas City’s first shopping center north of the Missouri River, built in 1956. Enjoy shopping at Antioch Crossing. Retailers and services open at this time include: Sears, Burlington Coat Factory, Goodyear Tire, and Bank of America. With 20 acres under redevelopment, we will soon have many more national and local restaurants, retailers, services and more to once again compliment the local shopping community and neighborhoods. Not only is Antioch Crossing undergoing a renovation and revitalization, but also the surrounding neighborhood. Planning is in the process to improve the current services, and add or expand others. Mobility for local residents will be improved with potential pedestrian connections and multi-use pathways. Antioch Center opened in 1956 as an outdoor plaza with almost 500,000 square feet, and was the first major suburban-style center in the Northland. Built with the automobile in mind, Antioch Center was designed with a retail center located in the middle of the property, and a sea of parking lots surrounding it on all sides for convenience. Antioch Crossing is coming soon! We’re redeveloping one of Kansas City North’s finest shopping centers. With the proposed improvements Antioch Crossing will become a destination for working, shopping, dining and entertainment. Click below to see updates on how the construction is coming along. With the redevelopment of the Antioch Crossing, tenants will have ready access to a local population of over 100 thousand people with an average household income of $55,000, all living within a 5 mile radius of the Crossing. And the local population will have renewed access to a greater variety of retailers, from local shops to national markets.